← What Symptoms Should You Watch for if Your Senior Is Prone to Pneumonia? Dehydration is when the body loses more fluids than it brings in. The results can be very damaging to a person’s health, particularly in elderly adults. Even when it is not hot outside, dehydration can happen in seniors. When family caregivers take the time to learn more about dehydration and the dangers the condition can put upon their loved ones, they’ll be able to spot symptoms and take steps to prevent it. How Do Seniors Get Dehydrated? Dehydration happens somewhat quickly in older adults and there are many factors that can contribute to it. One of the most significant is that seniors have diminished senses when it comes to thirst signals from the body. In other words, they often don’t feel thirsty, even when they need water. Another factor is that an elderly body often has a hard time holding onto body fluids, due to medicinal side effects, kidney issues, digestive issues and urinary incontinence. 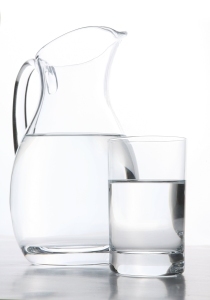 Many illnesses can cause the body to lose fluids easily. Finally, simple mobility problems can prevent seniors from getting drinks as often as they would like. There are many symptoms of dehydration in elderly adults, depending on the severity of the fluid restriction and the length of time in a dehydrated state. Early symptoms include thirst, dry skin, decreased urine output, dry mouth and dry eyes. Other symptoms include low blood pressure, fast breathing, lack of sweat and tears, loss of skin elasticity, and irritability. In cases of severe dehydration, seniors may experience confusion, dizziness, and loss of consciousness. Dehydration can also trigger complications in an elderly adult’s body. The complications that can arise from prolonged dehydration include seizures, kidney failure, swelling in the brain, loss of blood volume, coma and death. The dangers are very serious, especially if dehydration is frequent or extends over a long period of time. Family caregivers should do everything they can to encourage their elderly loved one to drink plenty of liquids and to report symptoms they feel to family members, home care services assistants and their doctor right away. Family members can help their aging relatives avoid dehydration in many ways. The obvious thing to do is to assist them in increasing their daily fluid intake. If they are drinking plenty of fluids, they are much less likely to be dehydrated. Anyone providing home care services can ensure that elderly adults are given plenty to drink at meals and also in between. Drinks like water, tea and sports drinks are better than soda. Many home care services assistants keep a water bottle within easy reach so that the elderly adult can drink frequently throughout the day. Caregivers need to remember that many seniors won’t drink a lot in one sitting and they are more likely to drink beverages that they like. With a plan of action, family caregivers can help their elderly loved one avoid the complications and dangers that arise from dehydration. For Home Care Services in Cordova TN, please contact the caring staff at Personal Care Services MidSouth today! This entry was posted in Healthy Eating for Seniors, Home Care Services Cordova TN and tagged Home Care Services Cordova TN. Bookmark the permalink.